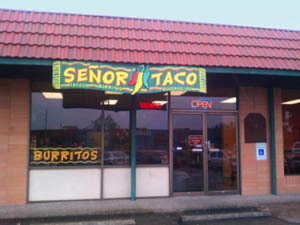 The Gonzalez family opened Señor Taco because there was a need for authentic tacos in their hometown of Federal Way. The Gonzalez's family home was always a place for good food and good times where family and friends could enjoy authentic Mexican food, and they wished to bring those experiences to everyone. So in June of 1998, they opened the doors of Señor Taco and it was an instant hit. Their customers become loyal fans of their delicious food made with the finest ingredients. To this day, it is the preferred Taqueria for many people who enjoy their authentic tacos and salsas. The winning combination of a simple menu, flavorful dishes, and friendly service have kept fans of Señor Taco returning day after day. "We have six types of meats for our tacos, burritos, quesadillas and tortas, as well as fish for our tacos and burritos. We use nothing but the best quality meats and ingredients with no preservatives and the food is always fresh." - Diana Gonzalez, Co-Owner. "Señor Taco is my first food stop on every trip from California :) "
"Que ricos y deliciosos tacos, ya se me antojaron unos de lengua...mmmmh"